"41UR315, 2003.08.1262" by Timothy K. Perttula and Robert Z. Selden Jr.
DECORATION (INCLUDING MOTIF AND ELEMENTS WHEN APPARENT): The rim panel, outlined by upper and lower horizontal engraved lines, has a horizontal scroll motif repeated three times around the vessel. The upper and lower scroll fill elements consist of pendant triangles. The scroll dividers are excised vertical lines. Ripley Engraved, var. 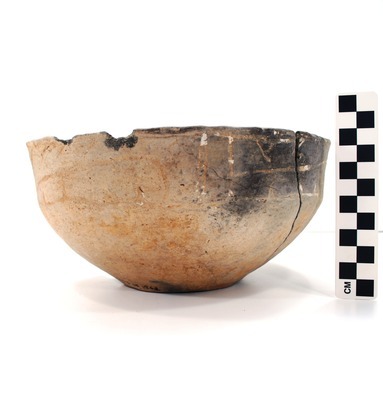 unspecified carinated bowl, Vessel No. 2003.08.1262.